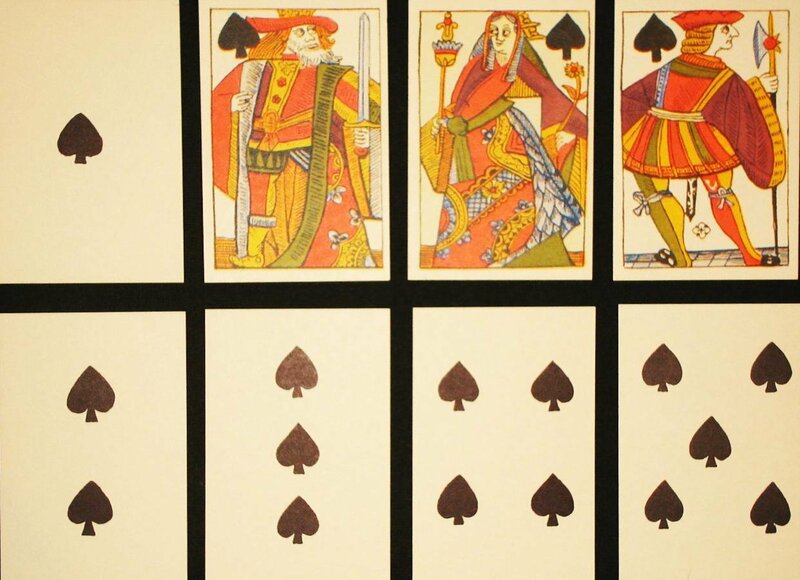 Categories > Card Magic > Medieval Design Playing Cards With Modern Finish? 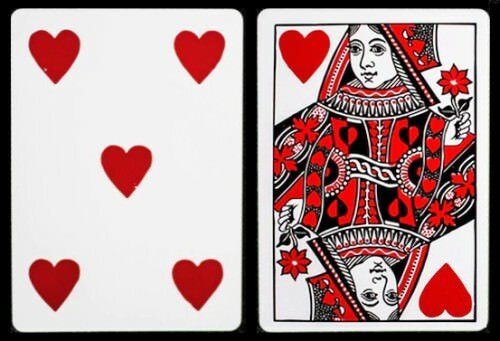 Does anyone know of a source for cards that have one of the many designs of a medieval card deck, but that has a modern finish/texture? Most of the ones I've found online are all hand made and focus on the design. They usually are just regular card stock like you can get from an office supply store. So you can't handle them like you could a modern USPC deck. I got close to what I'm looking for with one of Christian's decks over at Cardshark.de. And I LOVE LOVE LOVE Phoenix decks. But this one was just not finished in the same way. It's kind of...dry, if that's the right word. There isn't any of the finish that makes USPC cards sort of slip and slide against each other so easily. I do most of my performing in my medieval group. And though I often use modern decks, I love using the Cardshark one for the look and feel of it. It's just soooo appropriate for the situation. But top changes and other sleights that us a single-card push-off are super difficult. Whilst not exactly what you had in mind if you can find the USPCC printed Paragon deck they would fit a medieval setting perfectly and they handle like good Bikes. I also love the built-in "disressed/aged" look in the design. Anyway, I'm looking for something more along those lines. But I do appreciate pointing me in the direction of the Paragons. I am going to try to pick up a deck of those anyway! Ken, while you've probably already done so, Googling "medieval style playing cards" and using the Shopping tab yielded a variety of options. Heh. Yes I have. the one my eye went straight to costs $3K for some reason :-P. Maybe they are the real thing. Plus they are from 1800s. And like most cards advertised as "medieval," it's the backs they seem to focus on, with totally modern faces. The one deck that looks like it might work has a huge "American!" written on the box. Sigh. Thanks for sending the link though! I'd be willing to pay for it just to check it out if nothing else. Ha, I was sure you were liking them (f**k for grammar)! I´ll ask them tomorrow about the finish, as I said they are mostly (?) plastic coated so they run quite smoothly. I´ll let you know!! I assume you know that the Heirloom Deck you showed has some very interesting properties (the kind that would get your thumbs broken in a casino). I agree about the finish on these cards ... they don't fan smoothly but I find they handle ok for most purposes. At least that is true for my deck. Yes, Robin - exactly. That's the one I have. And I did just realize I was mistaken about them not carrying it anymore. I found it on there earlier today. I love the deck - all except for the texture/finish of the cards. It's very unreliable when it comes to running or pushing off single cards. They are quite a bit stiffer and rougher than your standard USPC deck. As you say, they are fine for a lot of things. They riffle shuffle OK, though I've not been able to do any decent faros with them. Thanks for pointing out that they still carry them though. I'm not sure if this is what you are looking for, but have you checked out the The Medieval Deck by Egor Klyuchnyk, published by Elephant Playing Cards and printed by Expert Playing Card Company? This deck was produced in Legends Playing Card's Robusto stock, and is a sturdy stock that is very durable and high quality. I've seen those. Though they are medieval "themed," showing mages of knights in armor, etc, they look nothing like any actual period decks. I would like to have something that is somewhat authentic. Have you checked out some of the "replica" decks produced by Home Run Games? They reproduce period decks, but are printed by USPCC with the usual air cushion quality. Thanks Axel. I appreciate your checking. I wonder how many thousands of dollars it would cost to have USPC create a deck for me? I might could possibly sell them at the medieval events and on the web or something. EndersGame - The pic you put up is pretty close to what I'm looking for, but still very modern with the border and prominent index. In fact this deck is called the Saladee deck, commemorating the very first deck with indices, which would have been in 1864. The other problem with these is the design on the back. I really need either nothing on the back (in 1600 and earlier, cards didn't have designs on the back), or something quite subtle, like the ones from cards-shark. On the PlayingCardDecks.com site, the only really authentic looking cards they have are Tarot. And they DID use taro for games in period (pre-1600). But that is not what I'm looking for. Most of the "medieval" or "historical" decks are all "homage" type decks that are totally modern but with pictures of knights or whatever. I can't find much of anything that looks much like an actual deck from even the 1700s except the Rouen deck, which has court card images that are authentic from a period deck, which is great. But then there is a massive index AND it's only the court cards that have the period look. All the pip cards look completely modern. Sooo close. I'm actually tempted to order this deck but...out of stock. Sigh. Thanks for the tip though. I really appreciate it. Have you seen these? https://www.amazon.com/Highlanders-1864-Poker-Cards-Replica/dp/1572810963 Not 1700's but pretty old-looking. Link not working, Robin? I searched with the name of the deck and found it in various places. 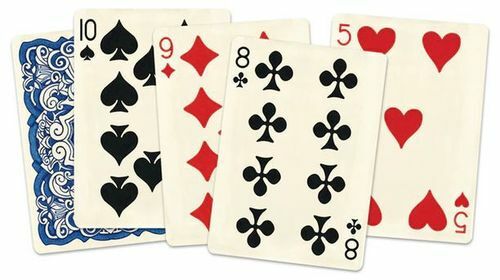 Finally found what a few of the cards look like here: https://www.usgamesinc.com/1864-Poker-Deck.html. These look pretty decent and get close to what I can use. One thing that concerns me is from the comments from customers. One says "It mimics the card stock that was used in the historical deck as well as the artwork." Though as you say, 1864 is not 1564." That probably means they won't handle like a modern deck. I'm looking for a deck that handles like a modern deck, with modern finish, etc. but that LOOKS like a deck from the 1500s or earlier, if possible. I wouldn't mind using one with a design from the 1600s or 1700s if necessary. But either way, this seems a futile search. I wonder if there is a tutorial somewhere on how to make your own cards that handle like modern cards? I know there are layers and chemical coatings, etc. But I have no clue what to do beyond that. Ken. I asked a similar question a little while ago and EndersGame suggested Uusi Classics. The Uusi Classic deck produced by the Uusi team of artists Peter Dunham and Linnea Gits is very beautiful, and they are USPCC produced cards with excellent handling and quality. But I'm not sure it meets the other criteria Ken is looking for. Thanks Sibex and EndersGame. The main problem with these is the massive index. The index didn't come into being until 1864. So period cards are not going to have them. I was OK with the card-shark deck's index because it was so tiny - barely noticeable. That, plus the card designs themselves were authentic, if not specifically pre-1600. That's the other problem with these cards - the design does not look like any of the period decks I've seen. Thanks for pointing me in yet another direction though. Everyone is being so helpful - one reason I love this forum! The court cards based on a Charles Goodall design from the 1800s. And the cards don't have the usual numbered indices. I'm not a huge fan of the one-way pips on the number cards, but you can't have everything! They are printed by USPCC on high quality stock, so they are durable and handle well. Those look like a decent candidate for "better than Bikes" for my purposes, yes! Not perfect but I am getting one of those decks! Thank you!! Glad to have been of help Ken, and best wishes for your magic! Got my Mahdi The Magician "Hidden Leaves" cards today! I like them!!! They are not exactly what I am looking for. But they have one of the most important features - a lack of a corner index. Plus the faces - though not authentic to a medieval design - are at least different enough looking that they have less of a chance of snapping someone back into a modern mindset at one of our events. And the other huge thing is that they handle exactly like a modern deck of cards. Good to hear that you successfully managed to pick up one of these decks, and glad to have been of help, Ken! I just came across another option you may want to look into, Ken. "Faro gets closer to the old poker decks from 1800's. No index at all, one-way design for all the cards. Play cards as they used to do in 1800's with a modern and an esoteric touch. Faro will be printed by USPCC on their classic linen finish." Maybe these are too stylish for what you need, but they sure look classy and sophisticated!